George Graham Reviews Arian Saleh's "Antoinette"
World music has branched out in quite a few ways, from authentic versions of folk music from different cultures, to stylistic mash-ups with East meeting West in a haze of electronic sounds. As I have pointed out a few times before in this series, mixing styles like that can have widely varied results, from a highly creative symbiosis to a train-wreck of a culture clash. This week we have another example of a World Music influenced recording, though in this case, the exotic global sounds are more embellishments than the main focus of the music. It also mixes in a curious blend of old-fashioned pre-rock styles. 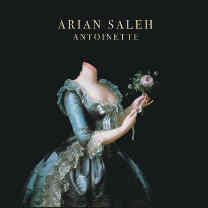 It’s the new second album by Arian Saleh, called Antoinette. Though Arian Saleh is based in Brooklyn, he has an interesting background which makes his world music influence seem natural. He is the grandson Monir Vakili, called Iran’s first lady of opera, and his mother is singer named ZaZa, who was born in France, grew up in Iran, was educated in Italy and now lives in Los Angeles, where Arian Saleh grew up. Saleh began performing around Los Angeles in 2009 and worked with some hip-hop producers, releasing his first record that year, called The Cobblestone EP, and toured extensively. While in New York, he began collaborating with cellist Dave Eggar, who has worked with many pop artists over the years as a studio or backing musician on the road; and drummer Chuck Palmer. They began collaborating both on stage and in the studio. They released an album called Undone in 2013, which caught the ear of a number of critics. When he is not working on his own music, Saleh has created music for independent films and widely-distributed TV commercials for cars and banks. Now Saleh, again joined by Eggar and Palmer, is out with Antoinette, and it’s an interesting and creative mix. There’s less hip-hop influence than his previous album, but it is a recording reliant on the technology of looping and sound manipulation of the instrumentation, but with Saleh’s high clear voice sounding relatively pristine in the mix. The influences run from rock to hints of hip-hip to the exotic textures of Middle East sounds with instruments like the oud and frame drums, but there is also some tango influence and a bandoneon, the Argentine accordion variant. The lyrics, though, are rather like an introspective singer-songwriter in considering relationships in a multi-layered, poetic way. In addition to the core members of the group, with Saleh on vocals as well as guitar, Dave Eggar’s cello and Chuck Palmer on drums, there are various other players who are brought in for the exotic stuff, and two bass players who are heard on different tracks, Amanda Ruzza and Ariel de la Portilla. The album ends with Disruption Days, an introspective song of an affair coming apart. There are more bits of musical esoterics through the multiply overdubbed strings of Dave Eggar. Arian Saleh’s new release, Antoinette is an intriguing and entertaining recording that combines some exotic-sounding Middle Eastern influence, with some crypto-nostalgia evoking some vague probably imaginary time and place. Saleh’s vocals are quite appealing, and if it were not in this setting, he could be a very good conventional singer-songwriter. But the way the unlikely influences come together is creative and often clever, and the arrangements, many by cellist and collaborator Dave Eggar, are imaginative. Our grade for sound quality is about a B-minus. While the vocals are generally clean, I think that the distortion of the instrumental sounds like the cello, which some may consider trendy, is to me annoying and generally uncalled for. The dynamic range, how well recording waters down the transitions between loud and soft, is like most albums these days, a cause for further demerits. Arian Saleh brings his family’s background in music from the Middle East and elsewhere, into his new album, adding to some more contemporary influences, in a way that nicely straddles the exotic with the pop. It’s the kind of music that draws me to its resistance to being categorized. It’s also an album that will grow on one, with each listening revealing some new facet from the instrumentation to the lyrics. It’s a nice addition to a world fusion library.